Ashley was born and raised on the Eastern Shore of Maryland. 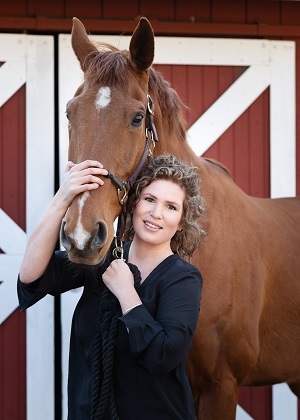 After she graduated Salisbury University, earning her Bachelor of Science degree in Biology, she spent the next part of her life working with horses. She moved to the Sandhills when her husband, Mike, was stationed at Fort Bragg. Ashley has settled in Southern Pines with Mike and their animals, and she is in love with the area! She enjoys taking her dogs for walks, traveling, exploring the Sandhills, and spending time with her horse, Ed. “When I first began to get out and about in the Sandhills area, the most important thing is that I feel welcomed. That is exactly how I felt from the minute I met Allan and the team at Towering Pines. He explained the “must knows” for home sales in this area and has continued to guide me on how to best help our community”, says Whitelock. “Starting a new career is a lot like buying a home. It is a major life decision; but when you feel supported and well-informed, it makes for an amazing memory. That is what I have with Towering Pines!” Ashley can be reached at (443) 235-7561, or by email at Ashley@ToweringPinesRealEstate.com .